The base class is getting derived by all container classes. The class handles synchronisation and paralellisation of edits and provides several voxel-getter/setter. All methods are threadsafe, if not declared different. worker may gets run by several threads. calculateVoxelPosInTile converts an absolute voxel-position to an relative container-confirm position. A inside tile position. Voxel-position of voxelPos inside a tile. calculateVoxelPosToTileId converts an absolute voxel-position to an relative container-id position. full If false all voxel get initialised with default value. doNextEditMaster finds out which tiles the edit affects and dispaches the change to the worker-threads. change Must not be nullptr. editVoxel edits the container. Its guranteed that the edits are getting in order of calling this method. Returns immediately. Does NOT calculate any voxel, but creates and dispatches the jobs for it. editVoxelDoneMaster gets called after edit got applied on the tile. Call method only by one thread at a time. editVoxelWorker affects with change holder. Method gets called paralell by various threads. Method only affects the delivered holder. holder The tile which gets affected. getTileHolder returns a utils::tileHolder setted by setTile() or by editVoxel(). Read-lock class before call. Read-lock the class before. Always returns a valid value. If nothing found state in utils::tile gets set to empty. 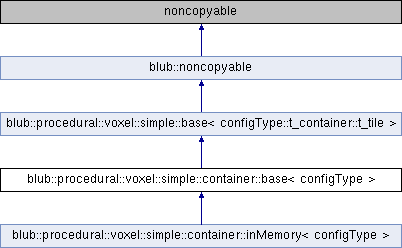 Implemented in blub::procedural::voxel::simple::container::inMemory< configType >, and blub::procedural::voxel::simple::container::inMemory< voxelType >. getTileHolderByVoxelPosition returns a utils::tileHolder setted by setTile() or by editVoxel(). Read-lock class before call. always returns a valid value. trans The transform of the edit. setTile sets a tile. You may wanna call this method on loading or synchronisation. Method is threadsafe. Write-lock class before. setTileToFullMaster sets a tiles voxel to minimum - for memory optimizations. Method gets called by a single thread at a time. setTileToFullMaster sets a tiles voxel to maximum - for memory optimizations. Method gets called by a single thread at a time. Reimplemented from blub::procedural::voxel::simple::base< configType::t_container::t_tile >.